On November 8, Big Labor’s favored executive-branch and legislative candidates got shellacked in Midwestern, Southern, and even Northeastern states as voters rejected union bosses’ agenda of more and more monopoly privileges for themselves and ever-higher taxes for hardworking citizens. Thanks to the election results, the share of all U.S. private-sector workers who are employed in a state with a law prohibiting the termination of employees for refusal to bankroll a union may well rise, within the next few months, from 47.1% to more than 50%. Moreover, as key 2016 contests such as the Missouri gubernatorial showdown between Right to Work advocate Eric Greitens and Big Labor apologist Chris Koster heated up, political observers of all stripes agreed the perpetuation of compulsory unionism was on the ballot. Going into the campaign cycle, top union bosses in Washington, D.C., and their operatives in the Show-Me State were determined to ensure that term-limited Big Labor Missouri Gov. Jay Nixon (D) was succeeded by another anti-Right to Work chief executive. In 2015, the Missouri state House of Representatives and Senate had both voted lopsidedly in favor of H.B.116, a measure that would have protected employees’ freedom to keep and hold a job and thus support their families without being forced to bankroll a labor union. Only Mr. Nixon’s veto prevented the Missouri Right to Work Bill from becoming law at that time. And H.B.116 was approved by substantial majorities of the members of each of Missouri’s legislative chambers. Ousting enough House or Senate Right to Work supporters in the 2016 Elections to block the 2017 passage of forced-dues abolition would be very difficult, union strategists recognized. No wonder AFL-CIO czar Richard Trumka referred to the Missouri governor’s race as “the most important” going on anywhere in America last year. 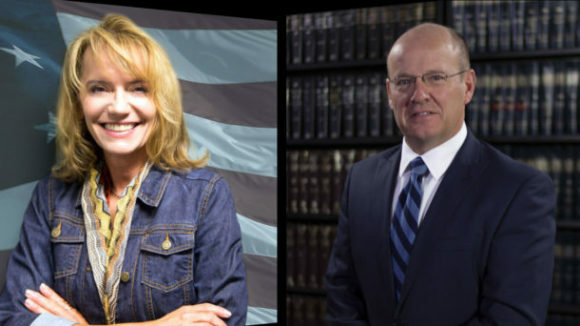 Even before the primaries were over and the GOP nominee was determined, the union political machine began pouring millions of dollars into the gubernatorial campaign of Democrat Chris Koster, Missouri’s attorney general. 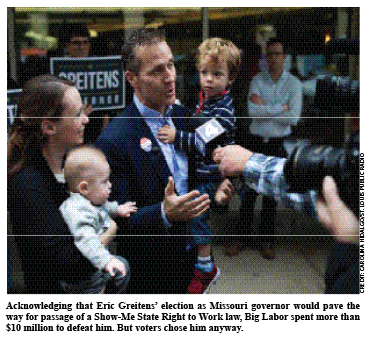 Meanwhile, Eric Greitens, the former Navy SEAL and political newcomer who captured the GOP gubernatorial nomination in August, courted the support of the overwhelming majority of Missourians who agree with the Right to Work principle. In the end, despite the fact that Big Labor spent, by its own admission, a total of more than $10 million to retain control over the Missouri governorship, voters backed the pro-Right to Work candidate for chief executive by a solid six-percentage-point margin. Voters also returned to office all Right to Work-supporting legislators in the Missouri House and Senate who sought reelection. “Based on the election returns and additional intelligence National Right to Work Committee staffers have obtained from our Missouri allies since Election Day, I’m cautiously optimistic that the Show-Me State will pass a law prohibiting forced union dues and fees in early 2017,” said Committee President Mark Mix. “But other landmark Right to Work victories may also be in store in Kentucky and in New Hampshire,” Mr. Mix noted. In the Bluegrass State, it has been clear since outspoken forced-unionism foe Matt Bevin (R) captured the governorship in 2015 that the sole roadblock to a law protecting the employee’s personal freedom to join and financially support a union, or refuse to do either, was the state House of Representatives. Mr. Mix explained: “Because the overwhelming majority of the Kentucky Senate had already gone on the record in support of a state law curtailing Big Labor’s forced-dues privileges, for the last year it has been up to Big Labor Democrat House Speaker Greg Stumbo [Prestonburg] and his allies to perpetuate them. Mr. Mix cautioned that, although the mostly pro-Right to Work Republican Party will hold a 64-36 majority in the Kentucky House this year, a handful of the Bluegrass State’s GOP representatives have histories of supporting forced unionism, and several other GOP House members are sitting on the fence. He vowed that the National Committee would mobilize its members and other identified grassroots Right to Work supporters in Kentucky to help get forced-dues repeal legislation to Mr. Bevin’s desk in early 2017. Yet another state that may well bar forced union dues and fees this year is New Hampshire. In 2011, a Right to Work measure was approved by both of the Granite State’s legislative chambers, and was blocked only by then-Gov. John Lynch’s (D) veto. But New Hampshire’s incoming governor, Republican Chris Sununu, was elected on a pro-Right to Work platform. Mr. Mix pointed out that New Hampshire’s passage of a Right to Work law would be an especially significant landmark because it would be the first state in New England to protect employees from forced union dues. The Committee is already preparing for a citizens’ lobbying campaign to get a Right to Work measure to Mr. Sununu’s desk. The vote in the state House of Representatives is expected to be close.